Managing the fuelling needs and costs of a ferry system that carries over 23 million passengers a year and operates 450 sailings a day on ten routes is no easy task. 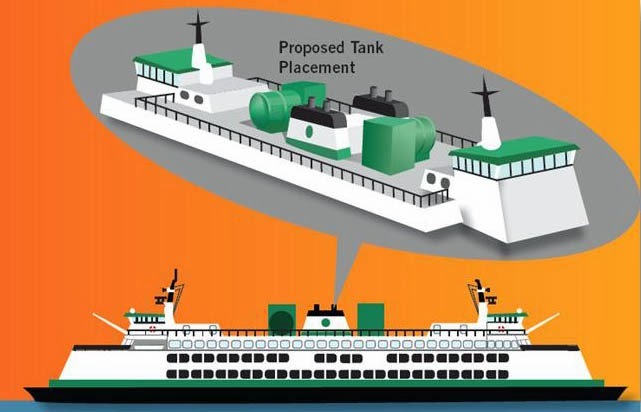 As North America’s largest ferry operator, Washington State Ferries (WSJ) burns around 17.5 million gallons of ultra-low sulfur diesel (ULSD) per year. That’s no small line item. Fuel is the agency’s fastest growing operating expense – in 2000 it made up just 11 per cent of the annual operating budget, compared to 23 per cent in 2013. David Moseley, Washington State Department of Transportation (WSDOT) Ferries Division Assistant Secretary, says the agency started looking at the possibility of using liquefied natural gas (LNG) about three and a half years ago. WSJ is currently considering converting six vessels in their Issaquah Class of ferries. The vessels are 30 years old and have another 30 years of expected operational life remaining. The conversion cost will be about $84 million. “We think the return on investment is somewhere in the six to eight year time frame,” David says. After the initial ROI is complete, he says the agency estimates it will save between 40 to 50 per cent on the cost of LNG vs. ULSD. The formal process to gain State-level approval began in 2011 with a submission to the U.S. Coast Guard for a retrofitted propulsion system, including new engines. That was approved and the Coast Guard is currently reviewing WSJ’s safety and security assessment, and risk management plan. The next step would be creating and submitting a final design. David says the fleet’s fuel is currently transported by truck and would continue to be delivered the same way for LNG vessels.